FringePop: Children of the Corn...Wait...Do They Grow Corn in Kansas? Children of the Corn...Wait...Do They Grow Corn in Kansas? A few times I've bought a cabinet card and wondered whether it was taken to commemorate a harvest festival. 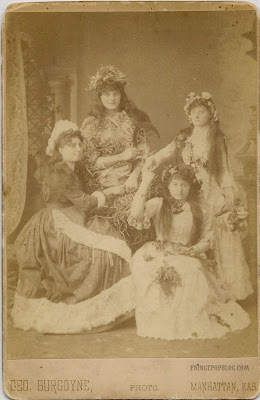 Well, now I'm posting a cabinet card that must be a harvest festival photo. The costumes, the flowers, the scythe one of the gals is holding. Harvest festival or not, I think it's a pretty lovely photo.